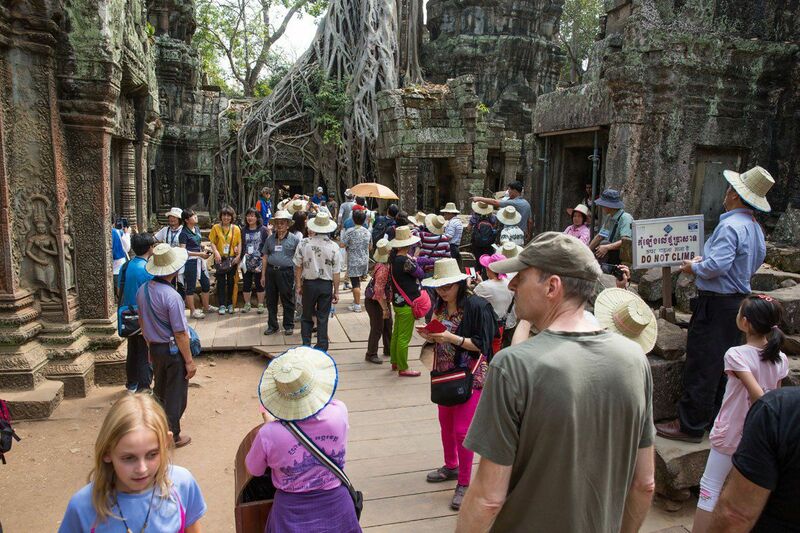 People from around the world travel to Siem Reap, Cambodia to tour Angkor Wat, the world’s largest religious monument. We were no different. 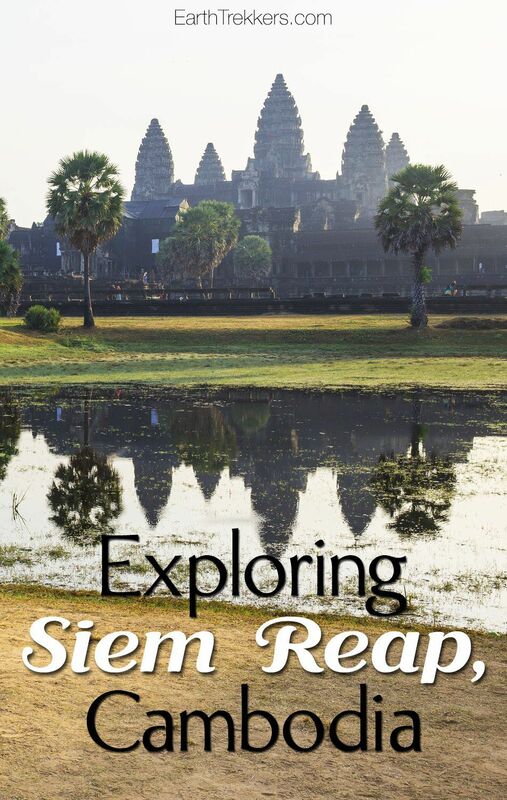 We had a week to explore Siem Reap and all it had to offer. 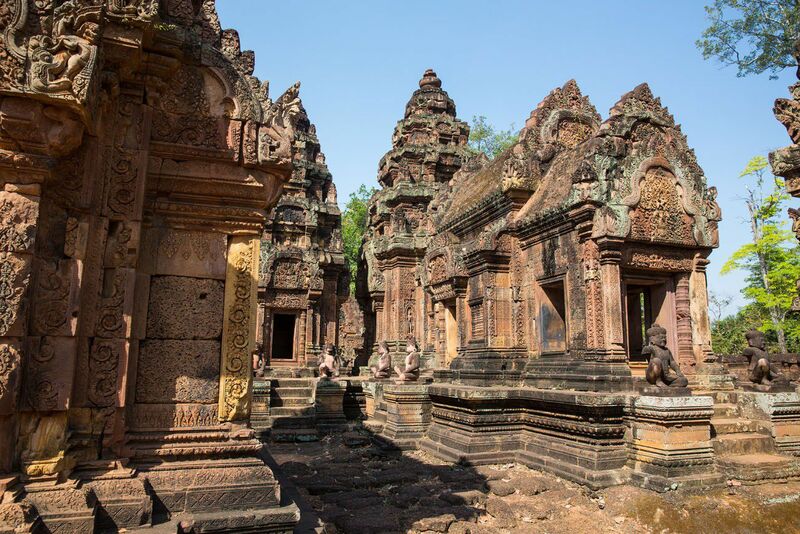 Before traveling here, we were familiar with Angkor Wat, but we did not know much about the surrounding temples, of which there are many. 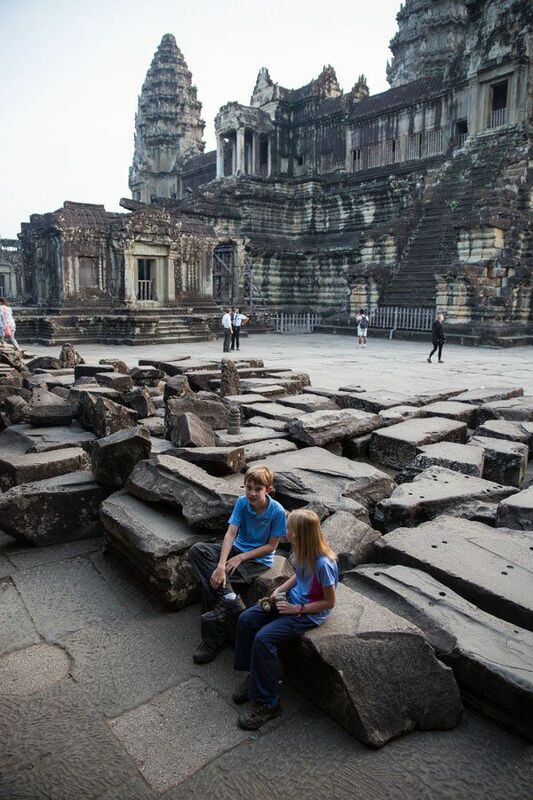 What we were surprised to find is that seeing Angkor Wat is good, but the other temples are so much better! 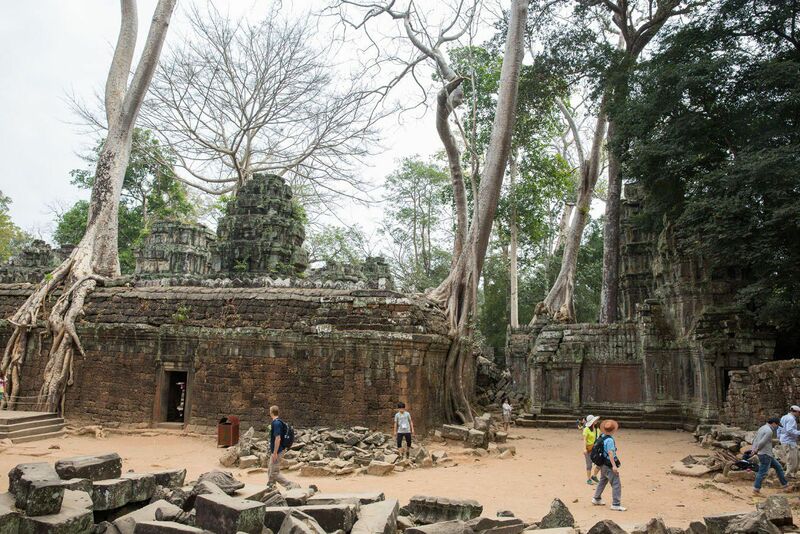 Like Bagan in Myanmar, the area around Siem Reap is littered with temples, now crumbling ruins located in the hot, Cambodian jungle. 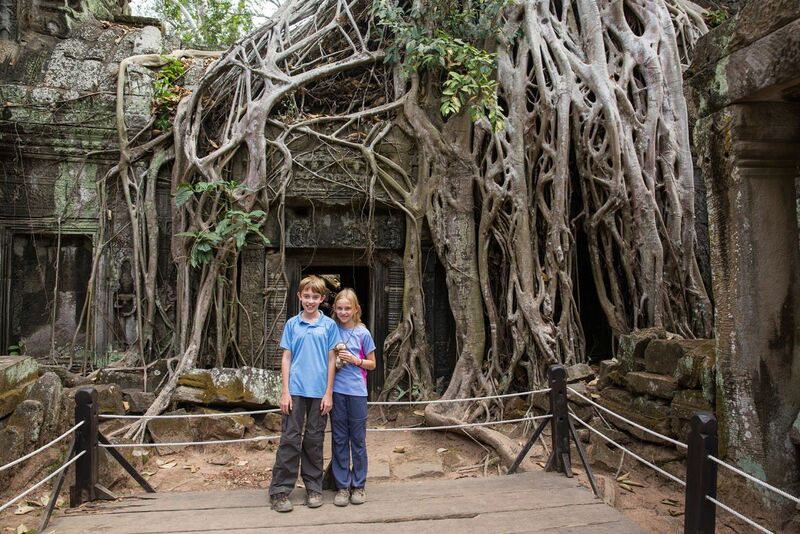 Tyler and Kara were not thrilled with the idea of visiting more temples, but here it was different. 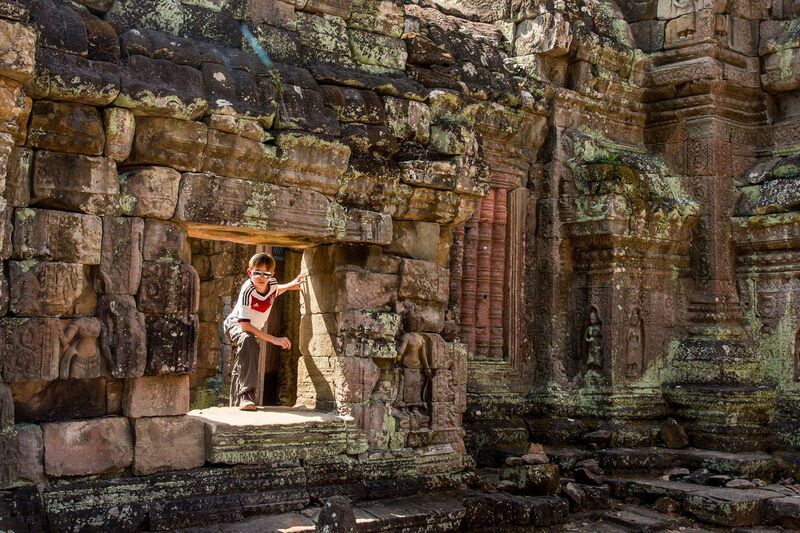 Here they could pretend that they were Indiana Jones, exploring lost cities, playing hide and seek amidst towering trees and 1000 year old temples, spying on their parents through stone doorways and alleyways. 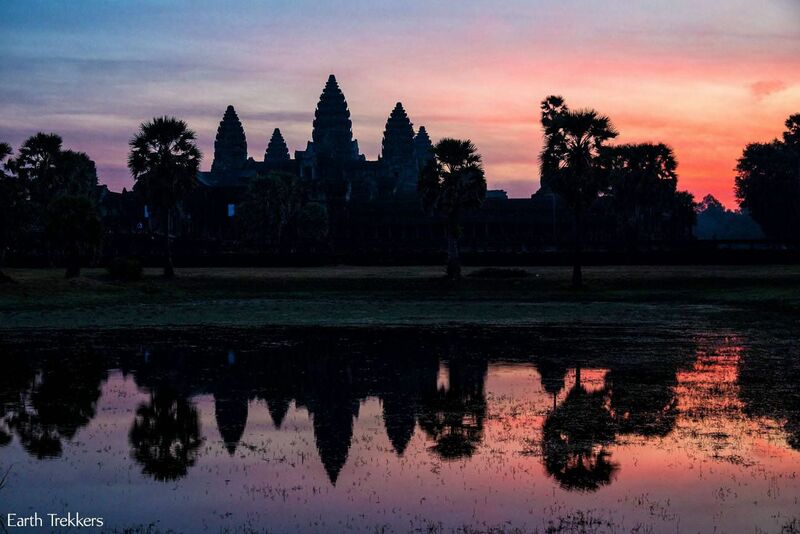 Our multi-day tour started with sunrise views of Angkor Wat. 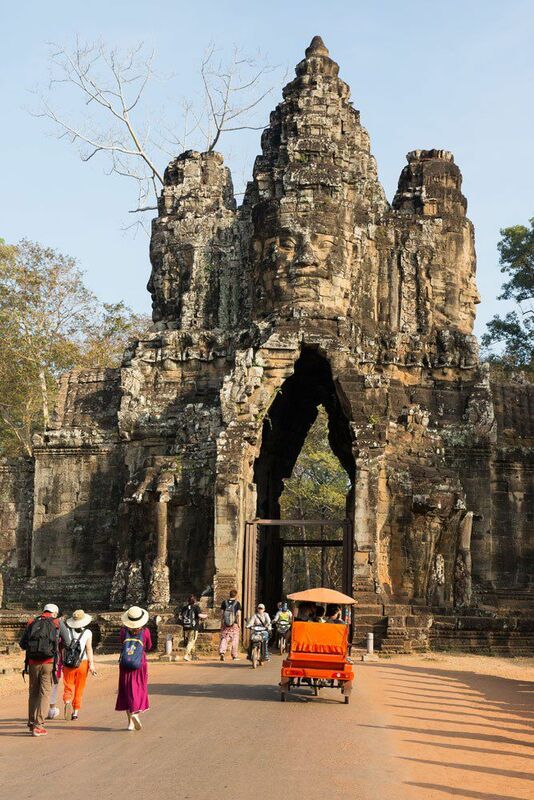 Who knew that waking up before the crack of dawn to look at a temple would be so popular, but we joined hundreds of other tourists (and their tuk tuks and tour buses) who were all doing the same thing. 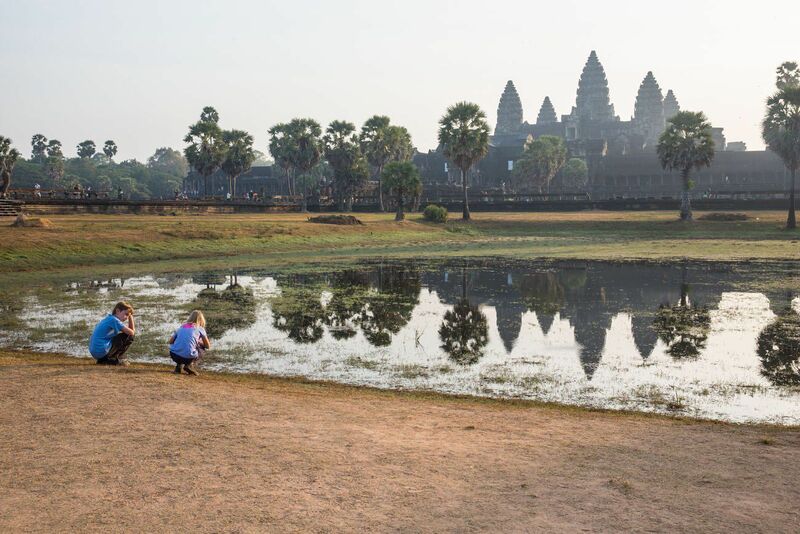 After watching the sunrise, we spent some time walking through Angkor Wat. 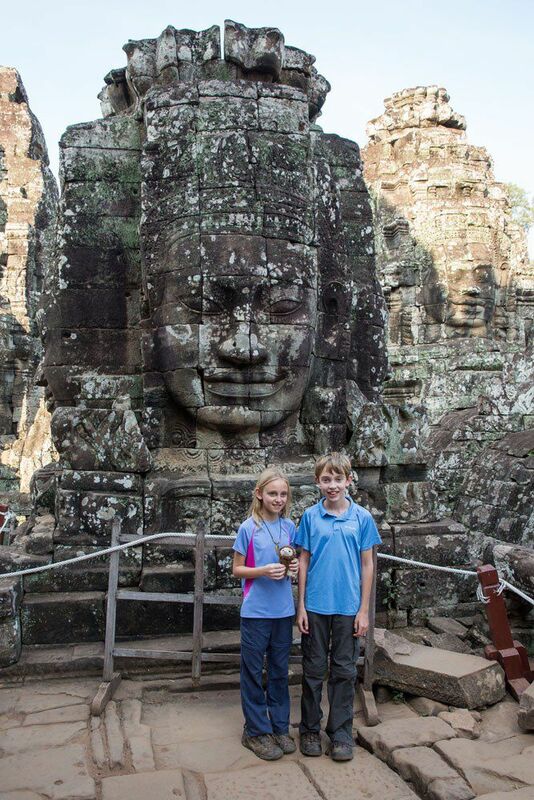 After visiting Angkor Wat, we headed north to the area called Angkor Thom. 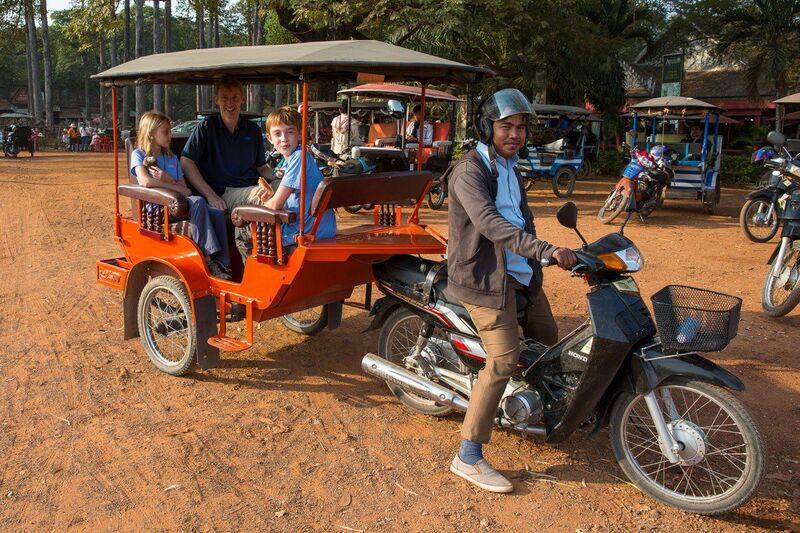 We were getting around by tuk tuk, a very popular method of transportation in Siem Reap, Cambodia. 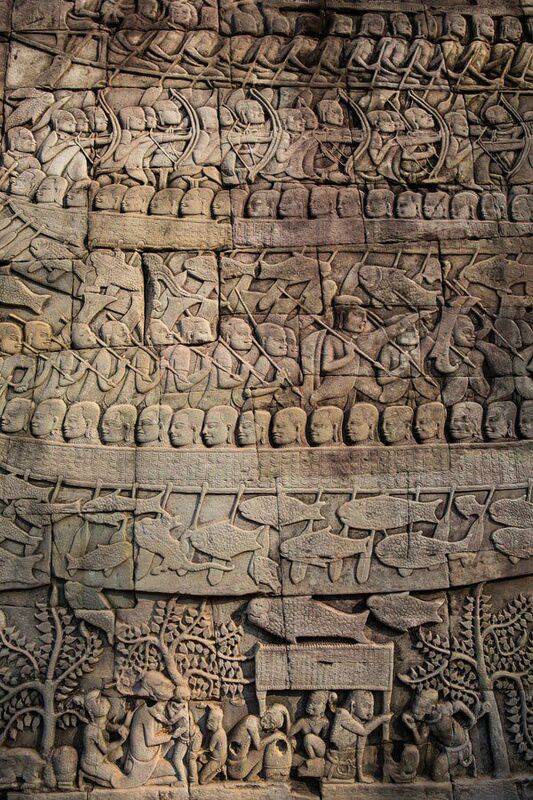 A moat surrounds Angkor Thom and the bridge over the moat is guarded by warriors on one side and demons on the other. 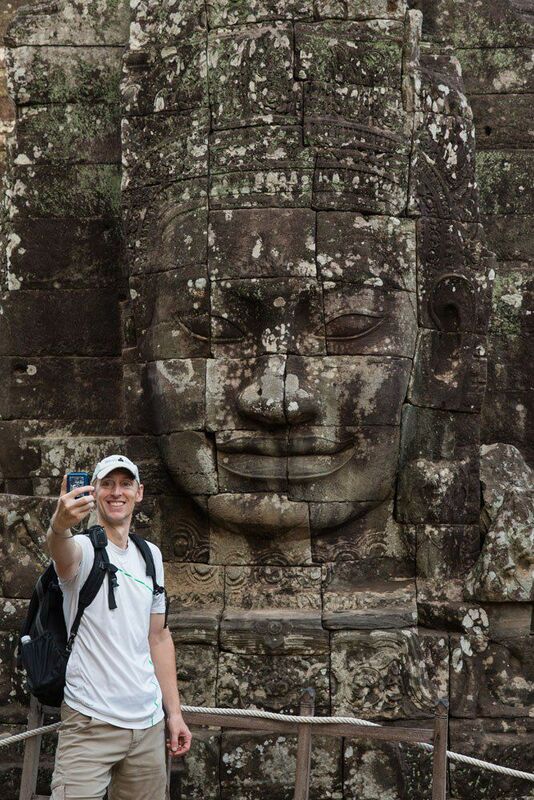 Next we saw our favorite spot, Bayon. 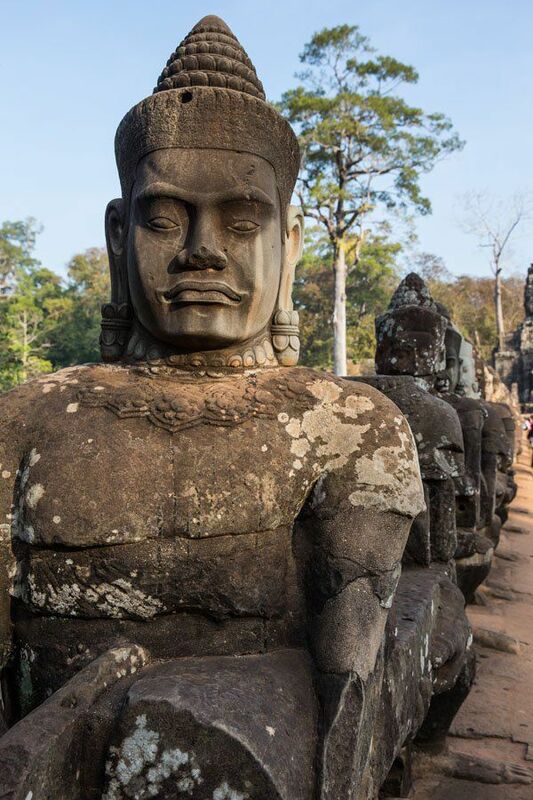 In the 1700’s, after Jayavarman VI defeated his enemy, he spent the rest of his life building temples. 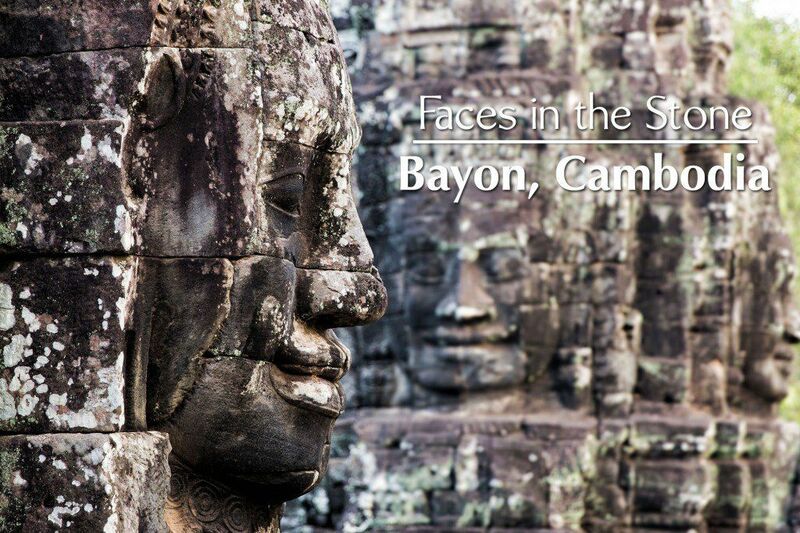 Bayon was one of these temples. 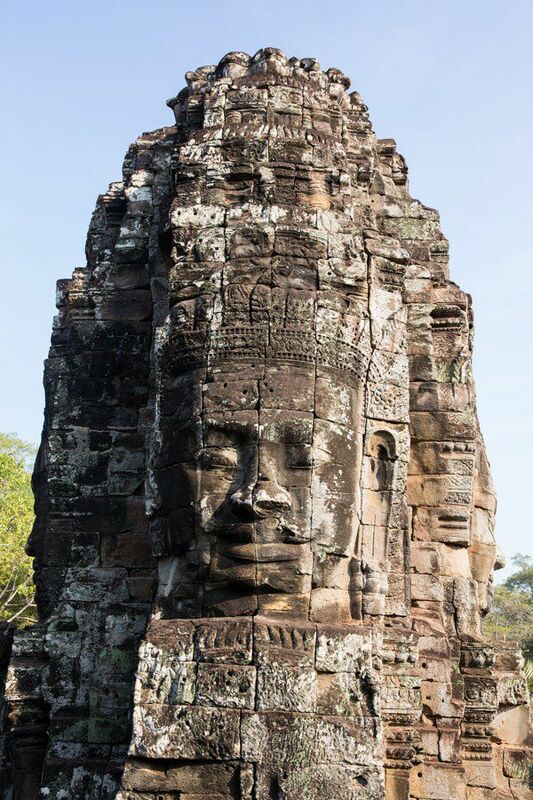 Here were over 50 giant faces carved into the rocks, the faces a blend of Jayavarman’s face with that of the Buddha. These giant heads stared down at us…very cool and a little eerie, and it’s such a unique place. Tim and I liked it so much that we returned on our own one morning by bicycle to see it again before the hoards of tourists arrived. 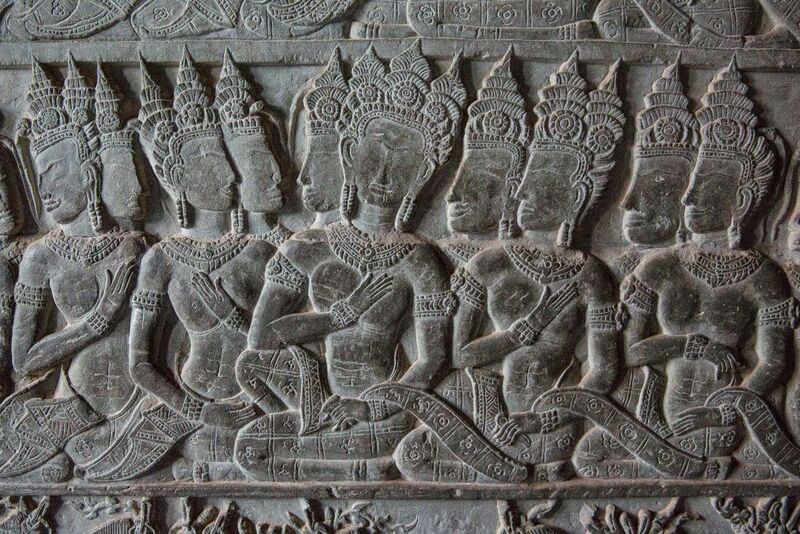 At Bayon there were also carvings on the walls, like this one. This was taken on a quick stop at Chau Say. 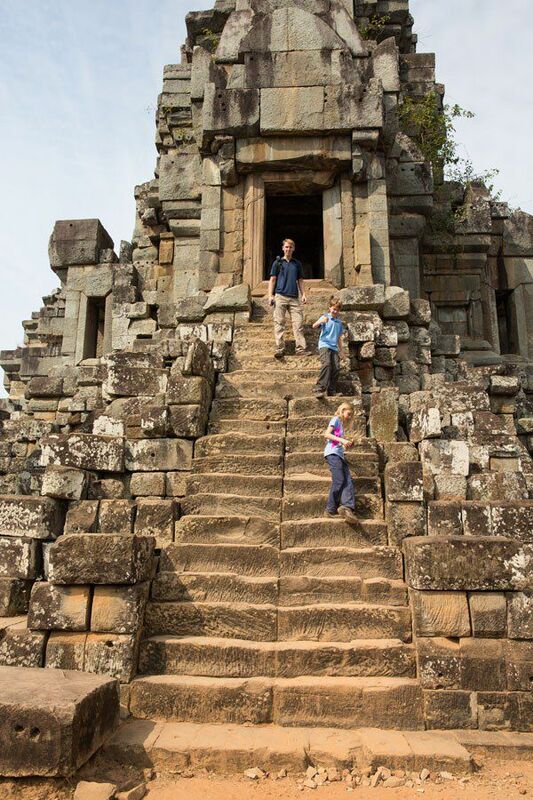 We climbed a lot of steps, like here at Ta Keo. 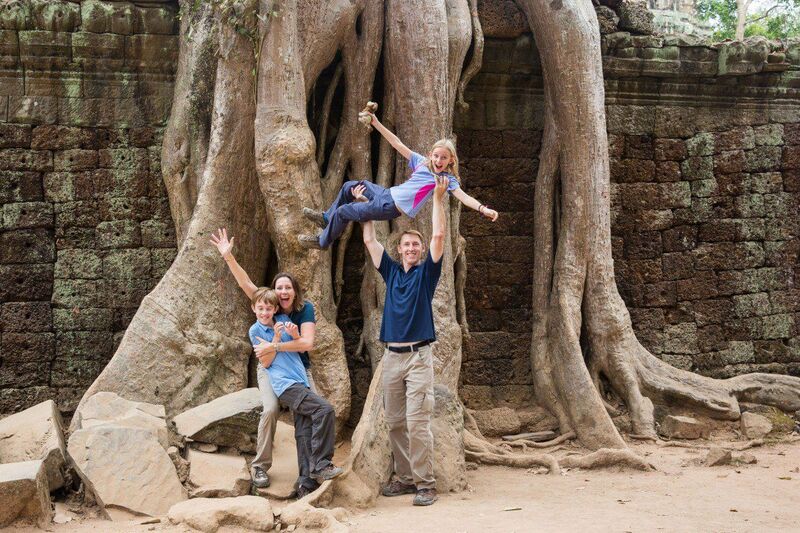 Next was another of our favorites, Ta Phrom. 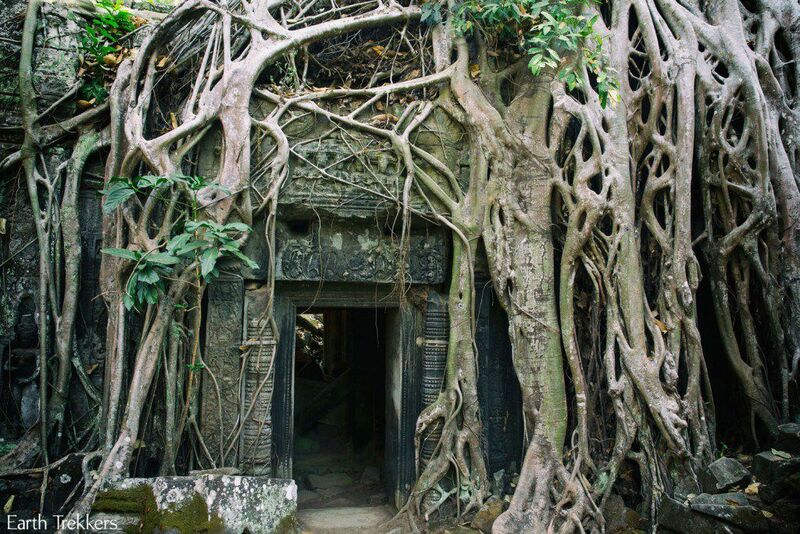 Here, the walls are really crumbling, everything is covered with moss, and tall trees towered over our heads. 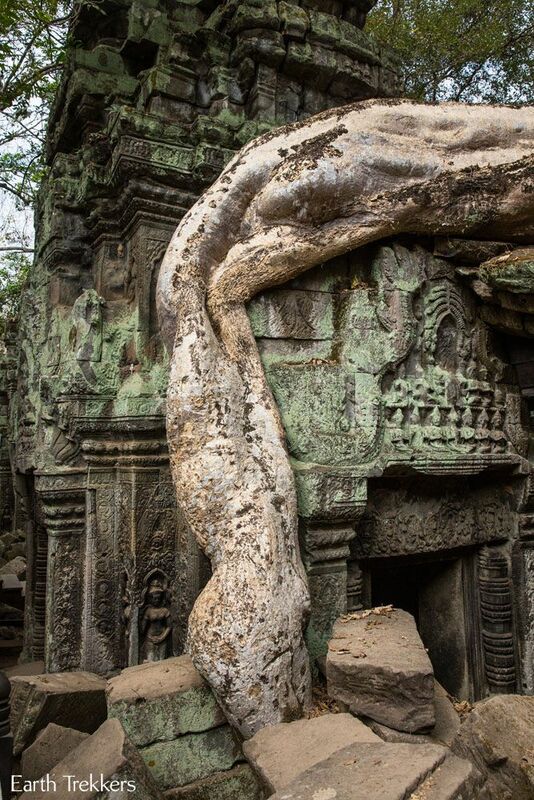 These same trees have taken root in the walls of Ta Phrom, sometimes growing directly on the buildings. This place looked so cool and so mysterious that it did not seem real; it felt like we were on a movie set. In fact, we were. 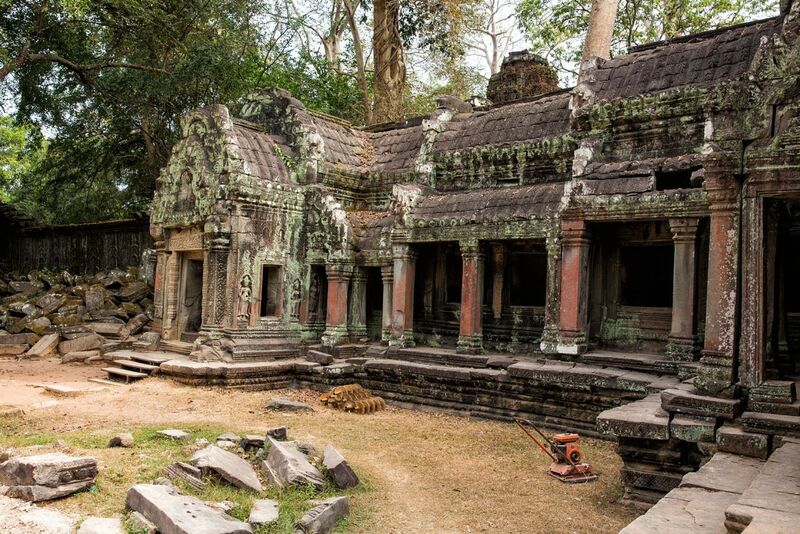 “Tomb Raider,” starring Angelina Jolie, was filmed here over ten years ago. This place was very crowded while we were here, as you can see. 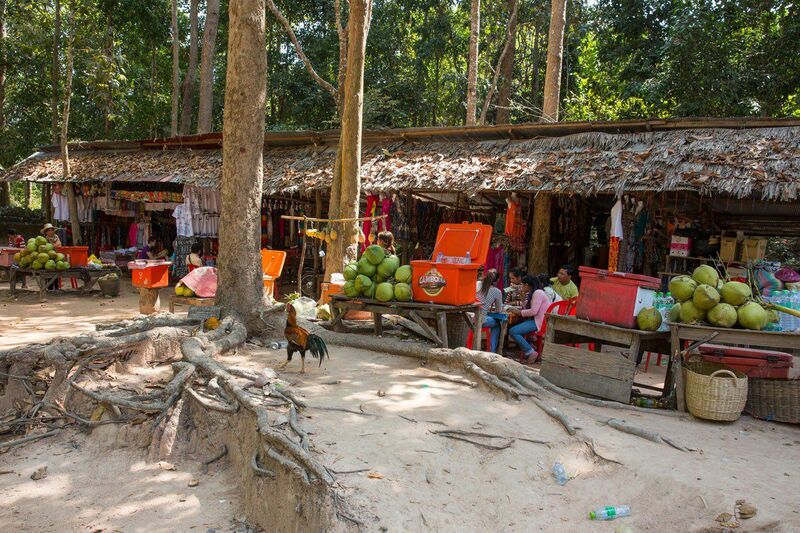 Outside of most temples were shops selling coconuts, pineapple, cold drinks, and food. 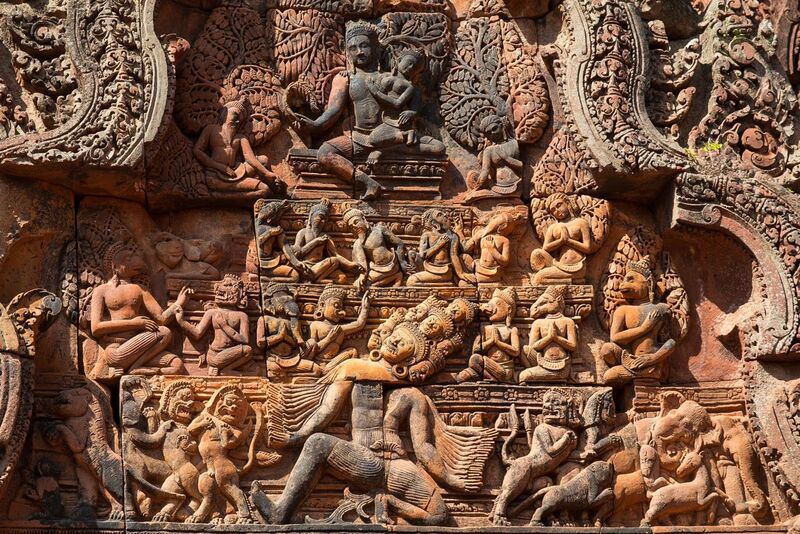 Our second day started at Banteay Srei, a one thousand year old temple located one hour away from Siem Reap by car. 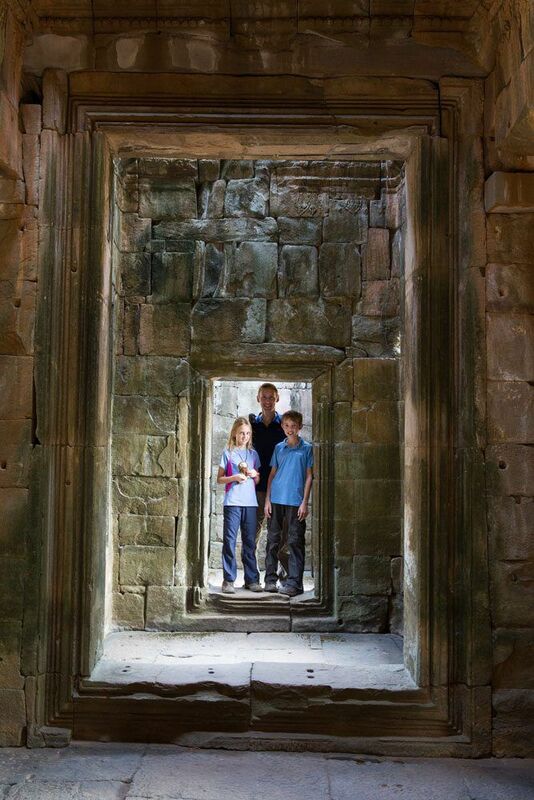 Next we visited Preah Khan, our favorite temple for exploring. 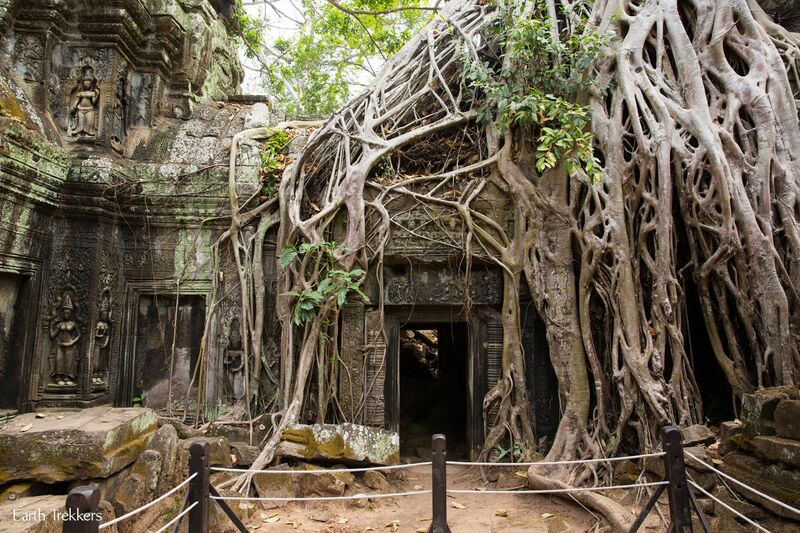 There were only a few tourists here, the temple was large and had great nooks and crannies to explore, and we could hear bats everywhere. There were bat droppings on the floor and we could hear the bats squeaking above our heads, adding to the mystery of the place. 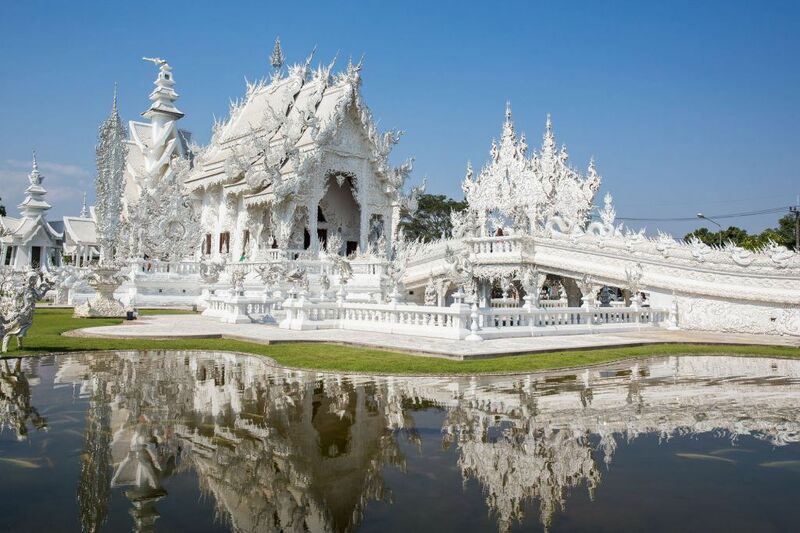 We saw many more temples than what is shown here, much to the delight of Tyler and Kara. Ha ha! Once again we were surprised with how much we liked it here. 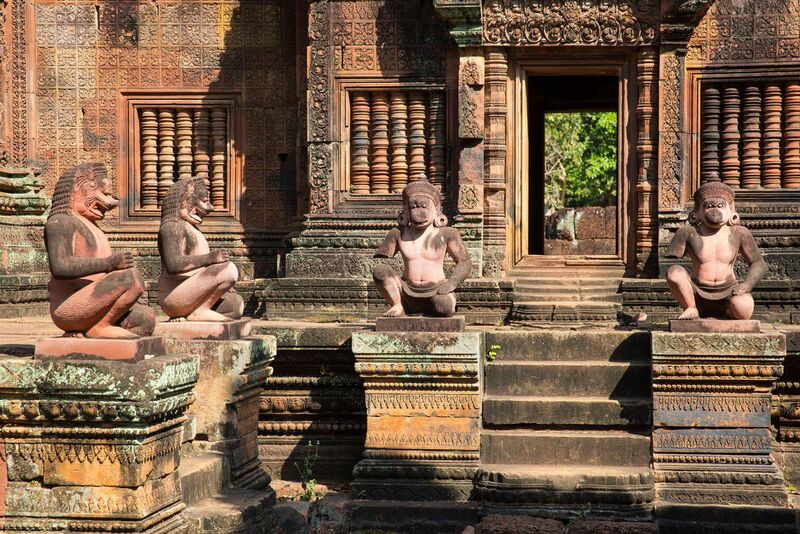 Angkor Wat and the surrounding temples are great and Siem Reap is an awesome town to visit. We were very sad to leave here, but from here we travel south to Phnom Penh, the capital of Cambodia, and then further south to Kampot. 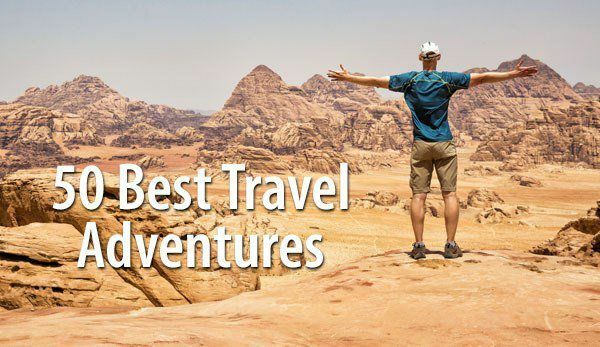 It’s always fun traveling somewhere new! 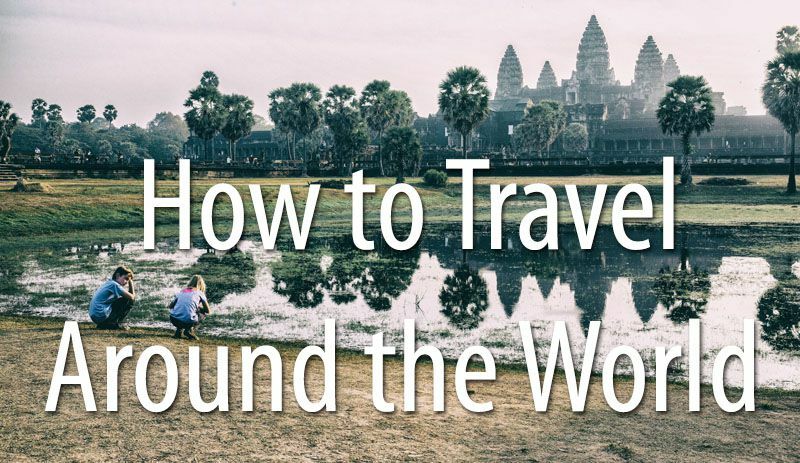 Are you planning a trip to Cambodia? 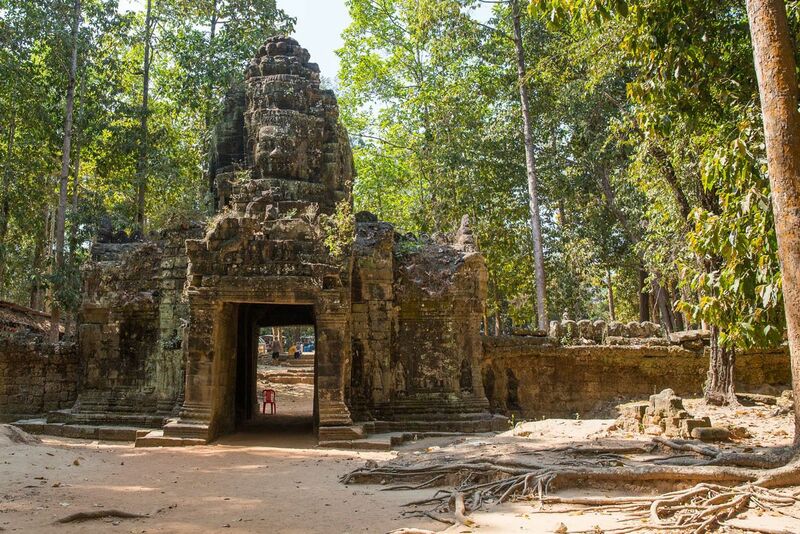 Read all of our articles about Cambodia in our Cambodia Destination Guide. Hi, love your trip. 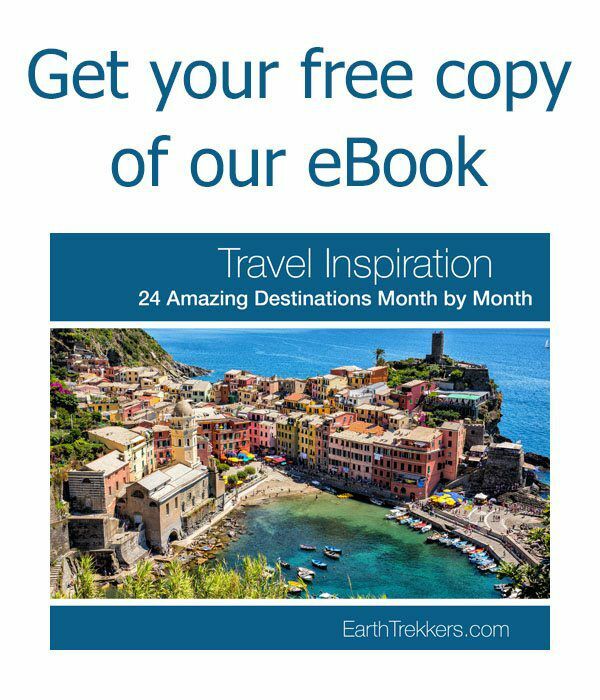 I followed your itinerary for Skye in Scotland and absolutely loved it. One of my fave places to date! 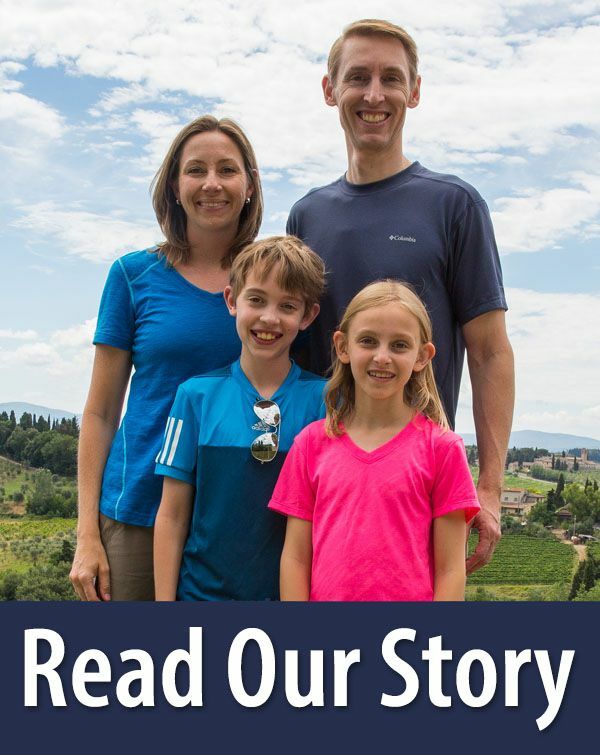 We enjoyed reading your blog while in Vietnam. 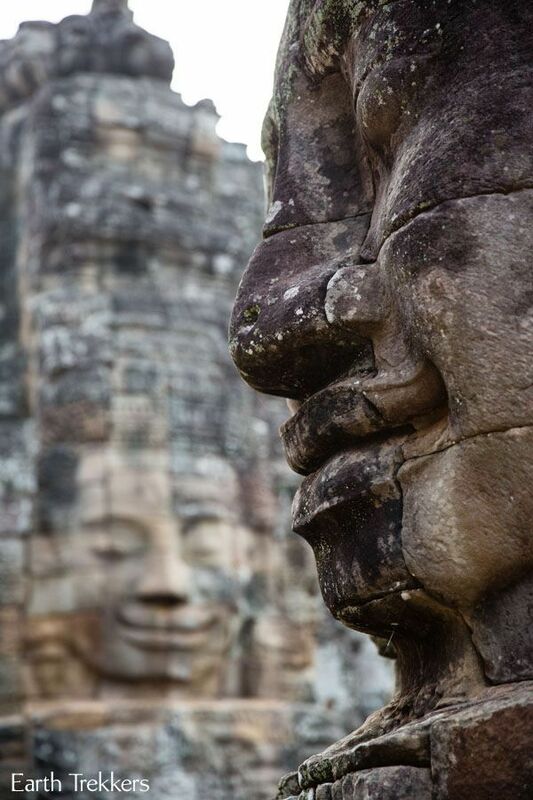 Can you suggest a hotel in Siem Reap ? My wife and I will be visiting there for two and a half days after I finish with the dentist in Ho Chi Minh City next week April 10-13. Thank you. 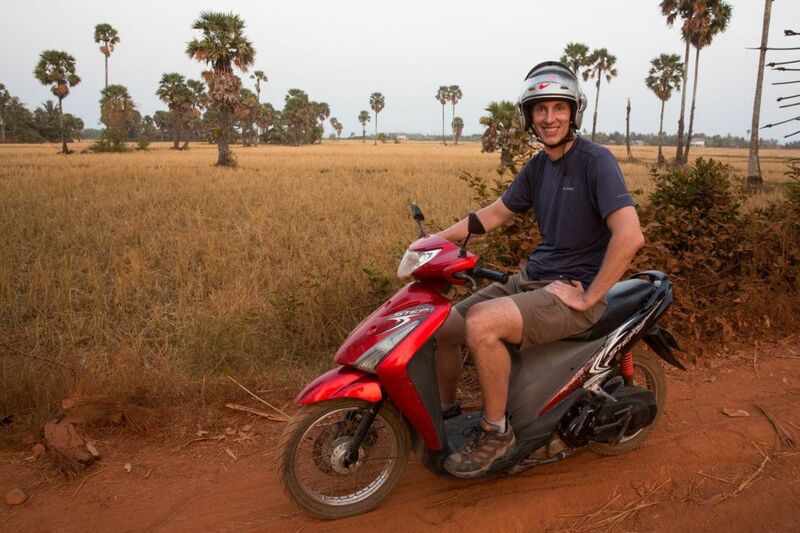 Yes, you can ride bikes around all of the temples. Most people take a tuk-tuk because it is quicker and easier. We did both, tuk-tuks and bikes, and in general, I’d recommend the tuk-tuk because it’s quick and your driver knows exactly where to take you. Even in January it was hot midday, so getting a breeze on the tuk-tuks helped keep us cool. Your knees and shoulders have to be covered, so capris are fine, shorts are not fine. And no tank tops. Hi Julie: Thanks for getting back to me so quickly. How did you go about renting your tuk tuks for the day? And do you tell the driver all the places you want to see, or do they just take you to places? Thanks. 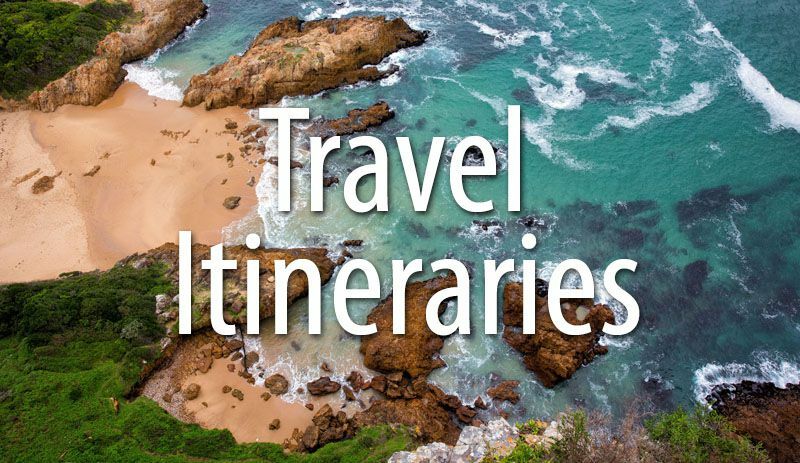 Your trip is so helpful in us planning our trip.. We will be traveling in these areas in March/April, after being in Australia in February. TOTALLY impressed by this one!Definitely will go there! You have an artist’s eye for the photos you take. They are simply lovely! It’s near the end of the day and I saw another blog had arrived so I got a glass of wine and settled down to have a good read. 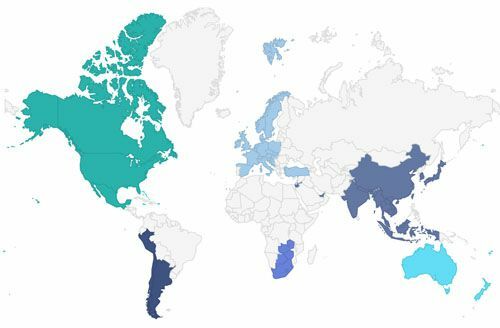 And I am surprised. Again. It is so uplifting to see these weird and wonderful places. 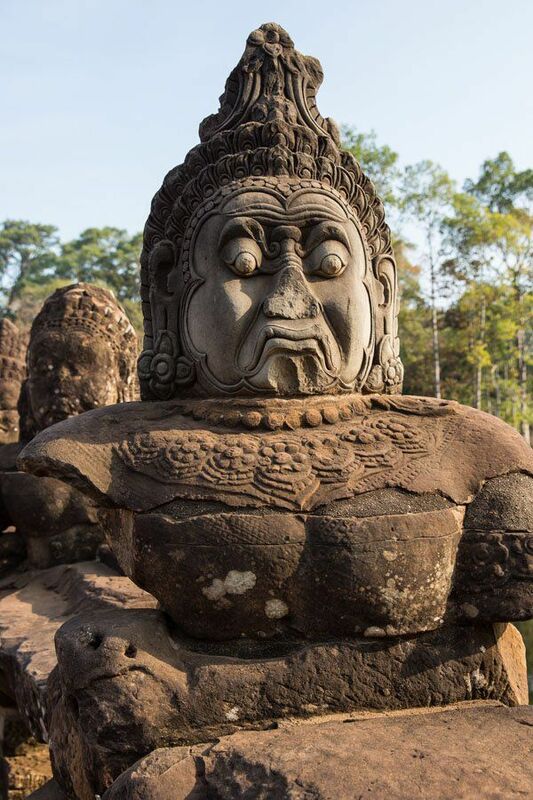 The large faces carved on the rock are startling, and unanticipated. I’m glad the carvers had some of them smiling! To change the subject, I’ve been noticing how much Tyler is growing, but now I see Kara catching up! 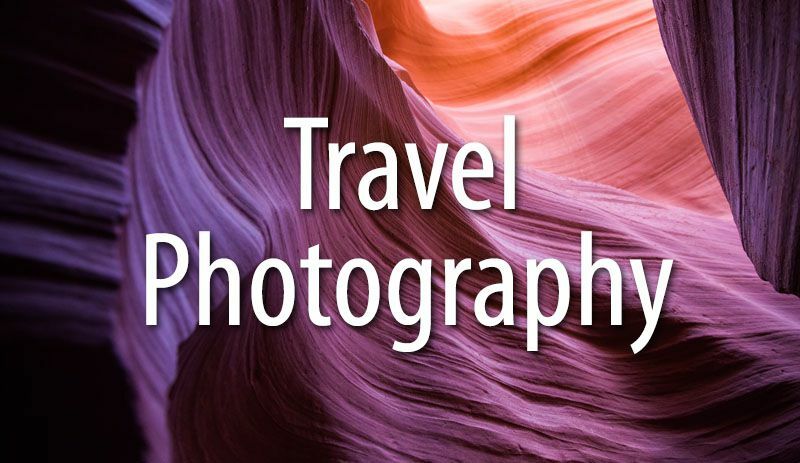 Thanks for the great photos and your informative descriptions! Julie, Did you read my e-mail on your just previous picture? It’s about the Cambodian Children’s Fund. Your pictures are totally amazing!! thanks so much for sharing + I’m delighted to see Tyler’s videos again. Tyler you sound so professional now!